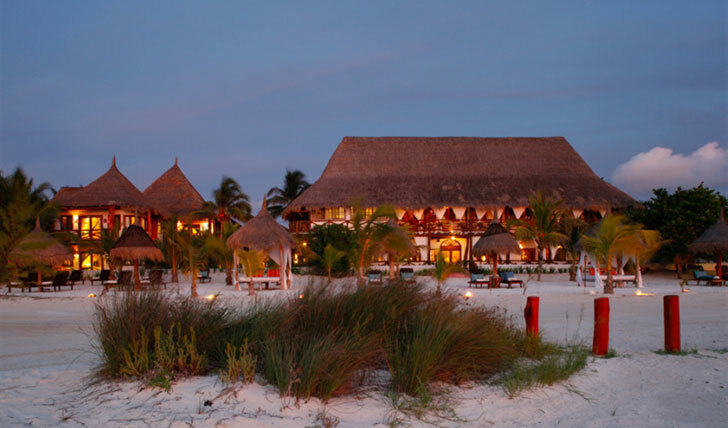 Casa Sandra Hotel on the Isla Holbox is one of our favorite undiscovered retreats. Isla Holbox is still widely unknown so you really get the experience of being in a secluded, serene island. Relax in your hammock outside your room by the white sand beaches and watch the tide come and go. Every piece of furniture is hand-made by local artisans so you’ll have everything you need, nothing more, nothing less, to give you a space for peaceful dreams on this island paradise. You can’t come to a tropical island and not expect the freshest of seafood. Casa Sandra is no exception. Tuck in to amazing dishes with a Cuban twist as they are all made by the “happy Cuban” chef, Felix, who loves to experiment with different flavors and spices in all his creations so be prepared for a unique meal every time you eat here, either at lunch time to admire the clear blue sea, or in the evening by the light of the flaming candle torches. Be sure to try the Camarones Coco Chipotle (prawns with coconut chipotle sauce) for a spicy seafood sensation. Seriously tasty. Spoil yourself at the spa, go kayaking, kite boarding or wind surfing in the clear, warm waters, and we definitely recommend exploring the seven-mile long island on your golf cart (yes, really). If you are there at the right time of year (around July and August) our absolute favorite thing to do is swim with whale sharks. Yes, we did say swim with sharks. We’re not joking. These gigantic fish come to this area every year to feed on plankton and krill and swimming beside one of these magnificent creatures is an opportunity that you absolutely cannot miss. If snorkelling isn’t your thing, don’t worry, there is no shortage of options to fill your day, and we won’t tell if you spend all your days simply lying on the beach. After all, you need a tan to show off when you get back home. Our favorite undiscovered island retreat, there’s nothing hectic or stressful about this hotel: just peace, quiet and relaxation. We’re sure you’ll enjoy the amazing food by the ‘happy Cuban’ chef.